My Spike Tactical ST-15 has been used and abused as a training and personal defense rifle and proven itself 100% reliable with thousands of rounds all while wearing the same original plastic handguard. This AR deserved a few upgrades beyond those extended trigger guard and ambidextrous charging handle upgrades from Phase 5 Tactical I reviewed in an earlier article. 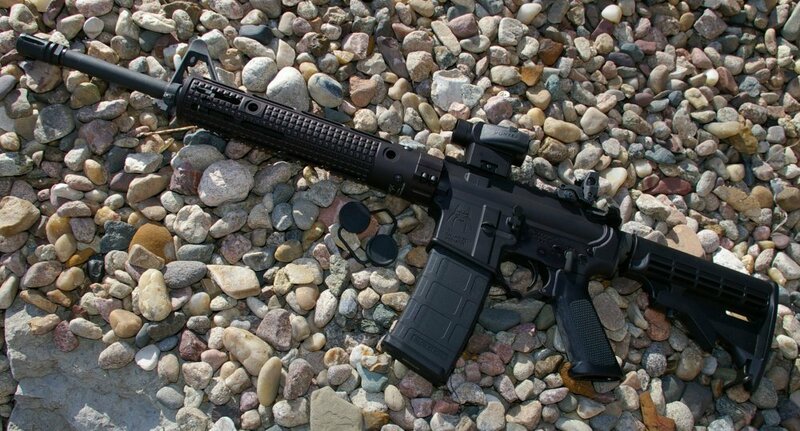 An upgrade I have been wanting to add the Spikes ST-15 sporting a Vortex SPARC sight is a free float handguard to increase extended range accuracy, improve ergonomics, tactical light attachment, and to give me just an extra bit of handguard real estate. My preference was a round non-quad rail handguard, something different, something cool, all while potentially providing me more forend real estate without replacing my fixed front sight. 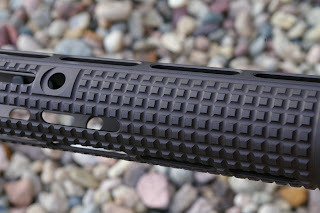 My search landed me on the Apex Handguard site which feature GatorGrip checkering on the handguard. What interested me most was the unique mid-length extended design and a great custom look. 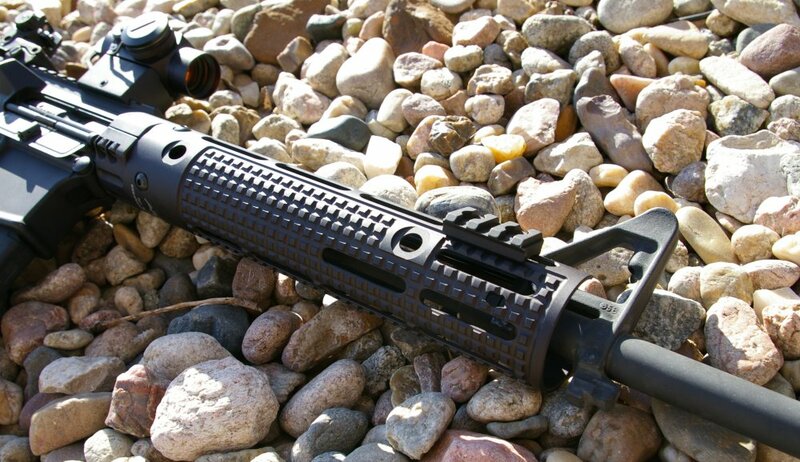 The overall fit and dark Type III hard Mil-Spec anodizing on the Apex GatorGrip Handguard is exceptional. 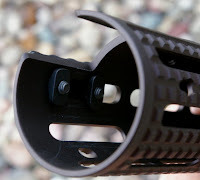 Once assembled, the handguard is rock solid thanks to a long upper and lower barrel nut clamp which adds tremendous support to the free float tube. The main complaint I have with almost all quad-rail forends is that they can be rough on the hands over a long day of shooting without rail covers but smooth forends tend to lack grip in some cases. The Apex handguard features a perfect compromise with extra course checkering Apex calls GatorGrip. The slimmer overall Apex Handguard profile is possible due to the offset barrel nut clamp. This thinner profile along with the GatorGrip provides a easier to hold hand locking grip all without being aggressive on the bare hand and improves heat dissipation to keep the handguard cooler. At 9.4oz this extended mi-length rail is a very light and could save a few ounces over other similar rails I have looked at and tested, but it still feels just as beefy. A great feeling handguard with well thought out fit. Most free float tubes include their own proprietary barrel nut, however the patented Apex Handguard System surrounds and clamps to the stock Mil-Spec barrel nut in a non-indexing style. 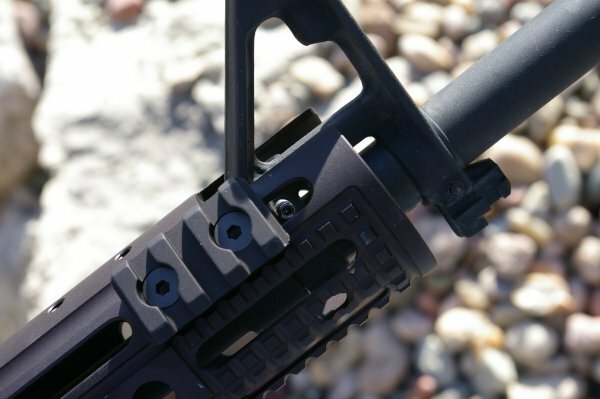 A non-indexed handguard mount allows you to assure the handguard to receiver alignment is perfect even if your barrel nut is a little over or under clocked. Beyond the immediately noticeable GatorGrip, the Apex Handguard System features a number of vents/slots at all the 90 and 45 degree positions. Apex has called these slots Controlled Tactical Rail Locating system (CTRL). CTRL obviously reduces weight and improves barrel cooling, but they also are designed to attach Apex’s various length accessory rails. I kept things simple and only installed a 1.5” rail for a tactical light, however Apex has full top rails and other various lengths as well to equip your handguard just how you like it and shape the layout to your grip and your shooting style. For my personal grip, I find the 9 o’clock positions just a little annoying for a finger operated tactical light, but it is better than other standard 3,6, or 9 o’clock positions. With the Apex’s CTRL Hanguard System, I can bump it up a bit to the 1:30 position and still have the ability to slide the positioning of that rail forward or back in the slots before tightening everything down. It may seem like a little thing initially, however after you have been limited by other rail systems, Apex’s CRTL improves ergonomics. The main reason I jumped on the Apex Handguard System was the Mid-Length extended version. 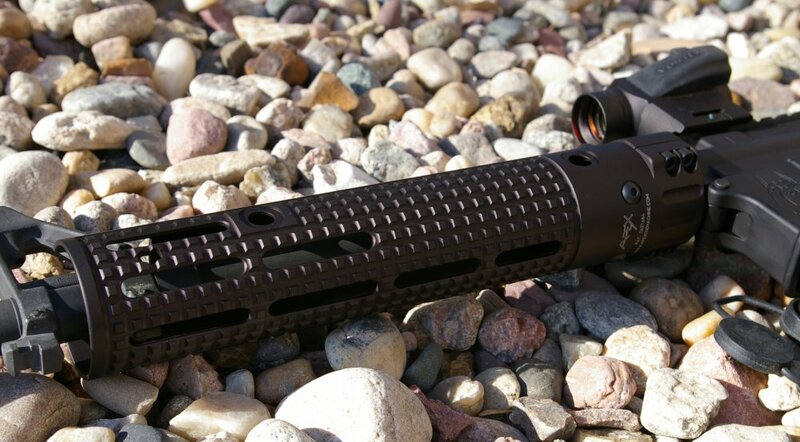 This basically pushes the handguard length out to the outside edge of the front fixed sight and provides a welcome extension of handguard room which allows you to get your tactical light or bi-pod out of the way of your normal working space. Other nice touches are specially treated machine screws which can survival 1000 hours salt corrosion tests and several hex wrenches to complete the install. 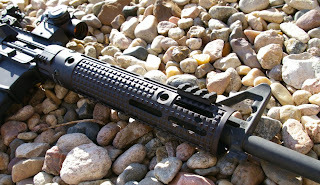 Installation was the same as any stock delta ring handguard to free float tube conversion. Remove the stock handguard, flash hider, un-pin and remove the front sight, remove the handguard retainer, and loosen and remove the barrel nut. 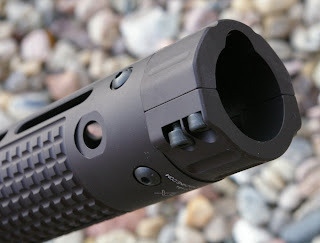 Once the barrel nut is removed, you need to separate the barrel nut from the spring and handguard retention parts and reinstall and torque the barrel nut back on the barrel. It sounds laborious, however it took me about 10 minutes to complete all the above including the 7 minutes of cussing and swearing beating the taper pins out out of the front sight... always painful but Spikes jams them in there really well. After this the Apex handguard coupler is aligned and clamped on to the barrel nut, the handguard is installed via four more machine screws. At his point you will realize there is a problem if you have a rearward sling mount on your gas block. I chopped mine with a Dremel cutoff tool and reblued it with Casey’s gun bluing (if you scratch and modify things, this is handy stuff). After test fitting you will also notice that the access hole provided in the Apex Handguard is just a little too rearward, or at least it was on my Spikes ST-15. Remove the handguard screws and slip the handguard forward just a bit allowed me perfect access to drive the final taper pin in and then I reattached the handguard. 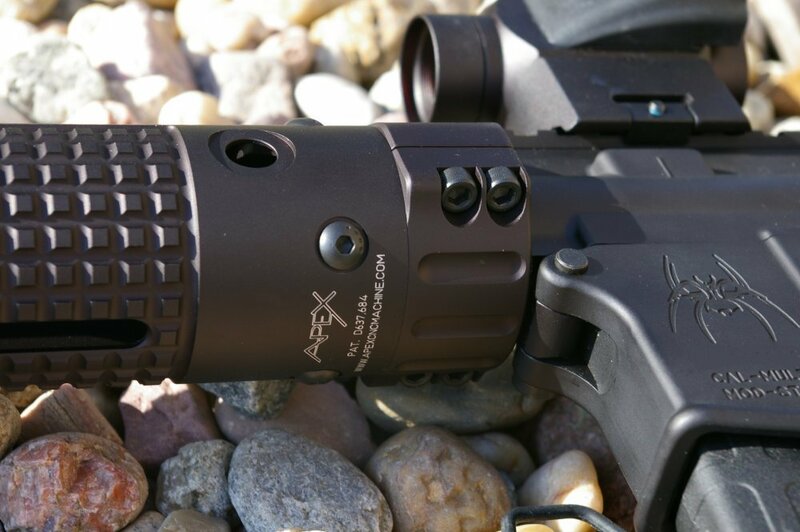 The Apex Handguard system also features four Quick Disconnect sling swivel mounts integrated into the handguard, so I was not to worried about loosing my front sling mount and sheds a little weight in the process. At that point re-install the flash hider and you are ready to go shoot.The whole process is much easier with the PRI AR Upper Vise Block by the way. It is the third installation hand you are looking for. Total installation for me was around 45 minutes including the modifications and waiting on the bluing to colorize. I will also admit one more modification while I had the front sight off. As I did on my Model 1 Sales Dissipator build, I also drilled, tapped, and converted the Spikes F-marked fixed front sight to an adjustable gas block. After testing the adjustable gas block on my previous JP build, and then on the Model1 build, it seemed like a no brainer while I had things apart to improve shooting comfort. Tune the adjustable gas block by dialing the gas down until the bolt fails to lock back with your lightest load and then back the grub screw out ½ twist and I doubt you will have any reliability issues. you can see the adjustable gas block's grub screw I installed. 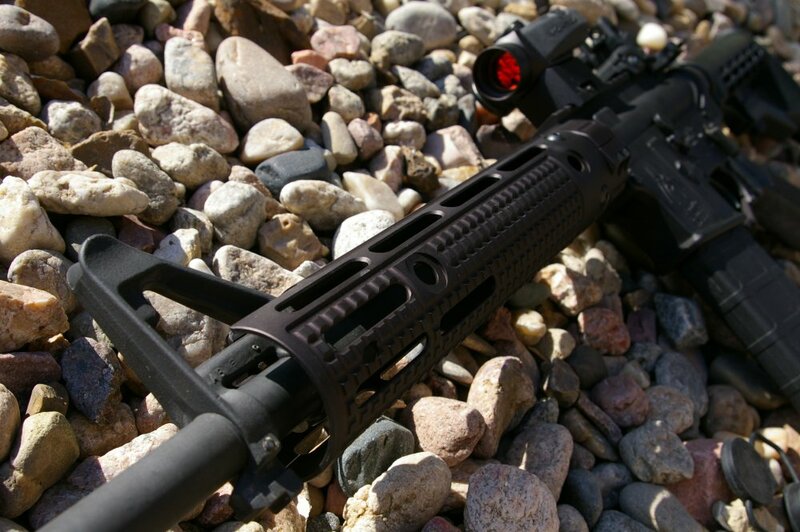 Once everything was assembled I headed to the range for a little “testing” and came home impressed with the comfort, stability, ergonomics and use-ability of the Apex Handguard system. 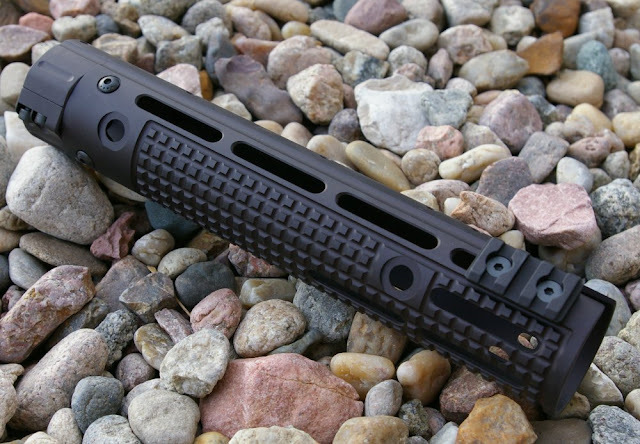 The Apex Handguard system is very unique spin on handguards. The thin profile, extended length, GatorGrip and CTRL features all work in unison to deliver a highly flexible and comfortable forend. The look is something that scream custom all for around the same price as other premium AR15 handguards. My Spikes AR gets used quite a bit along with a new Vortex Sparc and the Apex GatorGrip Handguard System definitely improved the overall ergonomics and shootability. Free float tubes are big accuracy upgrades and as expected this Apex tube delivered more consistent accuracy shaving .25”-.5” off previous best groups. 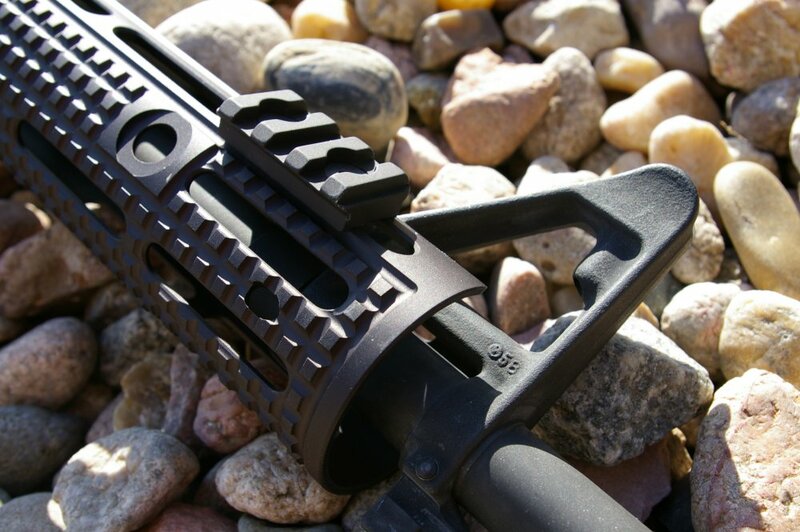 Everyone knows the standard brands of handguards however based on my experience I would highly recommend the Apex handguard for your next AR upgrade or build. That fact that it is one of the more unique and cool looking handguards on the market is just icing on the cake.